Many of the funniest and most memorable cartoon characters in motion picture history sprang from the animation division of Warner Brothers studios--Bugs Bunny, Daffy Duck, Porky Pig, and Wile E. Coyote, just to name a few. However, a decade before the boys at “Termite Terrace” brought those classic characters to life, Warner Brothers introduced Bosco, the very first Looney Tunes star. In his first couple of shorts it was obvious that Bosko was intended to be a racial stereotype of an African-American boy, with features based on the blackface makeup popularized in minstrel shows of the 1910’s and 20’s. 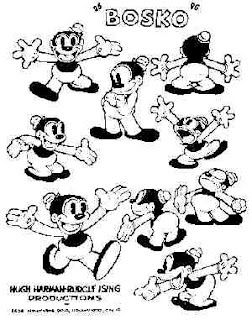 However, as the series continued, the offensive origin of Bosko became less obvious, and the high-voiced character began to more closely resemble Mickey Mouse without the large ears. The transformation was more or less complete by the fifth Bosko cartoon (and the first with an alcohol-related theme), The Booze Hangs High. The Booze Hangs High is nowhere near as funny as the classic Looney Tunes that would follow, and of course, Bosko’s racist origins are troubling. Today, The Booze Hangs High is best viewed as an interesting historical artifact from a time when America’s racial attitudes were less sophisticated and when animals bounced in time with music. 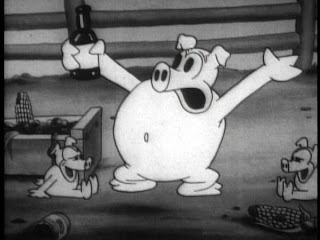 One interesting note--When Nickelodeon aired this cartoon on television, it censored a moment when Papa Pig drunkenly regurgitates a corncob. Video Availability--Available as part of the Looney Tunes - Golden Collection, Vol. 6 (Warner Home Video). This public domain short is also provided in its entirety above. Similarly Sauced Cinema--Early animated star Felix the Cat got high on hooch in the silent short Felix the Cat Woos Whoopee (1928).